But we’ve now arrived at the awkward part of the story; when all of our prior mistakes finally catch up with us, and the plot heads in a much darker direction. Despite more than a decade of an “all-hands-on-deck” propping up of the financial markets, all the central bankers have to show for it is the widest wealth gap in history coupled with stagnant wages. That, and a skyrocketing cost of living. Depending on which OECD country you live in, you can take your ‘official’ inflation measure and multiply it by either a 2x or a 3x to get the true rate. For example, in the US we’ve been told that inflation is running at just under 2% for years. In reality, it’s been trucking along at closer to 4% to 6% (for rural and urban dwellers, respectively). To summarize the situation simply: the central banks have been printing up new money and then handing most of it to the wealthy (via QE, which boosts the prices of the assets the rich own). Then they put on a good show of “worrying about inflation being too low” when the government issues its laughably doctored numbers. Anybody living in the real world (especially those trying to live on a fixed income) already knows that their actual inflation is much higher than 2%. Ditto for anybody that has bought a car, is paying for college tuition, depends on prescription medication, or has recently been to a hospital. 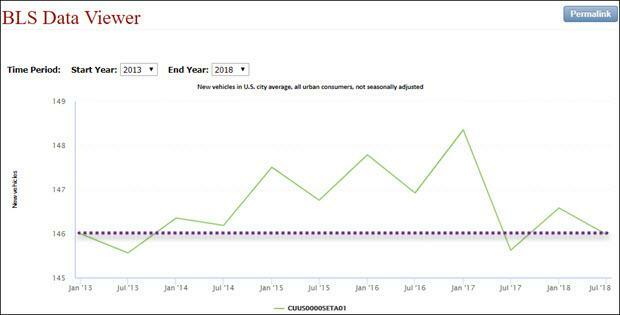 IRVINE, Calif., Feb. 1, 2019 /PRNewswire/ — The analysts at Kelley Blue Book today reported the estimated average transaction price for a light vehicle in the United States was $37,149 in January 2019. New-vehicle prices increased $1,481 (up 4.2 percent) from January 2018. 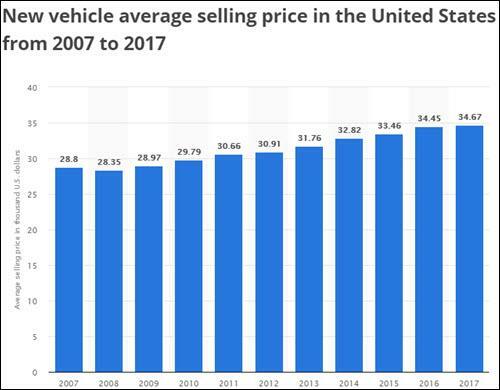 From 2007 to 2017 that’s a +20.4% increase in new car prices. Combining the data from the above article and chart, between 2007 and January 2019 new vehicles experienced a whopping +29% increase in their average selling price. As a real-world shopper, that’s how much more cash you have to spend to buy a car today vs a decade ago. To compare apples-to-apples: the BLS says that new cars are the exact same price, with zero inflation, between 2013 and mid-2018. Yet the real-world data says that new cars went up by +17% in price. So which is it? Is it a 0% increase or a +17% increase? The BLS has a lot of fancy explanations for their “math’, but the simple fact remains that a new car will cost you +17% more real cash dollars than it did 5 years ago. The government says $0 extra. The dealership says +$3,000 more. The former is a fake number. The $3,000 coming out of your wallet is a real number. I could go through example after example of where the BLS undercounts inflation. They do it with health care especially wildly, telling us that health care is increasing by ~3%-4% per year when everyone’s health insurance premiums are rising by 15% to 25% per year (or more!). Beyond the direct financial harm that results as Social Security recipients get very low or even 0% Cost-Of-Living-Adjustments (COLA) — which are based on the BLS’ reported inflation numbers — there’s an even more subtle and corrosive effect that results from being lied to by those in authority. With each fib, the populace loses more and more trust. And at some tipping point – bang! – they’re suddenly protesting the streets wearing yellow vests. It may take a while, but eventually folks catch on to the idea that “fairness” and “justice” are merely fantasies of the middle class. Both the rich and the poor already know better. But once the middle-class loses its faith in the dream, then it becomes a lot harder to convince them that another massive tax break for corporations is really in their best interest. As increasing concern spreads across the social landscape, for reasons well beyond the financial fibs outlined above, it’s becoming increasingly difficult to follow the competing narratives in play. For example: the economy is either doing great, or it’s busy imploding. Technology promises an amazing future, or it’s ruining our minds. The world is awash with cheap fossil fuels, or peak oil is in play and our standard of living is at risk. Either man-made global warming is an imminent existential threat, or there’s nothing to worry about. Making sense of all these — and many other — competing narratives is a full-time job. Almost nobody’s got the time for that. Lurking beneath every one of these dueling plot lines is this nasty, inescapable realization: Our entire way of life is unsustainable. It’s simply not possible to extract exponentially more raw materials year over year, forever. We all know that. It’s not a difficult concept to grasp. But the entirety of our political system, the mainstream media, and our economy are all predicated on the opposite being true, that endless exponential growth lies ahead. Like all delusions, this false belief will have a terminal encounter with the limits of reality at some point. There will come a time when attempts at further growth are counterproductive and cause more harm than benefit. In fact, we’ve already entered that period. We know that growth is killing the planet. Yet each day we are bombarded with messages imploring us all to invest in and hope for more growth. Those who have been paying attention know, quantitatively as well as morally, that more growth is not the answer. Yet it’s the only path forward offered by those in power. Stuck between an impossible idea and the strident repetition of its opposite, the populace grows ever more anxious. We can all see and feel that the end of the growth narrative is near — yet not even the barest glimmer of that inevitability is debated in the news or in any halls of power. (At least not publicly. Who knows what they’re saying to each other privately? Perhaps something very different, as evidenced by the rise in doomsday prep by the super-rich). As the social anxiety grows over facing a dimming future, our feckless Western press exploits that emotional tension to sell more consumer products and push political agendas, committing sins of commission and omission in the process. Outright lies are published. Key issues are left entirely out of the conversation (just look at the dearth of coverage on Europe’s Yellow Vest protests). And alternative information sources are denounced as peddlers of ‘fake news’ or Russian agents. Often it seems as if what’s truly important is intentionally avoided, while that which is absolutely unimportant is minutely examined with excruciating repetition. As I recently chronicled, the very bottom of the terrestrial and oceanic food pyramids are being knocked out. This is an existential threat to our species, but it’s hardly addressed in the mainstream media. It should front page news in a sustained and complete call for action. But it never is. This terrifying information should be commanding a large share of our attention. But it takes a very distant back seat to utterly meaningless political and social trivia that comes and goes like waves of petit mal epileptic seizures upon the national body. Huge signals of collapse that everybody needs to know about are breaking out with greater frequency and ever-larger and more worrying amplitude. It’s only a matter of time before something truly systemic snaps and we’re all forced to contend with terrible ramifications, ones entirely of our own making. Maybe it will be a nightmare collapse of key ecosystems within the planet’s web of life. After all, we’re carelessly and swiftly disrupting the interconnected relationships that species took hundreds of millions of years to develop. Or maybe it will be a political flashpoint resulting in war. A conflict resulting in even a temporary blockade of the free flow of global trade so critical for keeping all of our just-in-time production and distribution systems running smoothly could cause store shelves to go empty in just a matter of days. More likely in the near term, we’ll see an economic/financial meltdown. The third credit bubble of the new century is breaking down just like its predecessors did. Except this one is the and largest and most universal in history. A recession lies dead ahead. An even though recessions are an inevitable part of the economic cycle, and it’s been uncharacteristically long since the last one, we’ve been operating as if the current “recovery” will last forever. We’re woefully unprepared for what’s coming. And this next recession promises to be a doozy. The world is fraught with political and social tensions that were absent in 2008. And it’s saddled with many $trillions more debt than existed back then. But worst of all? The public has lost faith in our institutions and political bodies after having been so obviously, comprehensively and repeatedly lied to over the years. It’s kind of hard to ask people to embrace shared sacrifice during tough times after the political and financial elites greedily lined their own pockets at the expense of everyone else during the good days. In Part 2: You vs The Recession we scour the multiplying data exposing just how advanced the global recessional already is, how we expect its impact will manifest in the financial markets, and what steps you can take now to dramatically improve your odds of making it through the coming crisis. 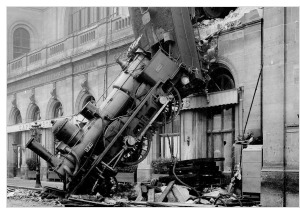 The central banking cartel, despite its increasingly desperate attempts, has not and cannot tame the business cycle. Our major concern is that this current credit cycle will burst far more viciously than the prior two — and those were painful enough. Because its effects are likely to be so damaging, we can’t overemphasize the need to prepare prudently now.